Eugene (/juːˈdʒiːn/ ew-JEEN) is a city of the Pacific Northwest located in the U.S. state of Oregon. It is located at the southern end of the Willamette Valley, near the confluence of the McKenzie and Willamette Rivers, about 50 miles (80 km) east of the Oregon Coast. 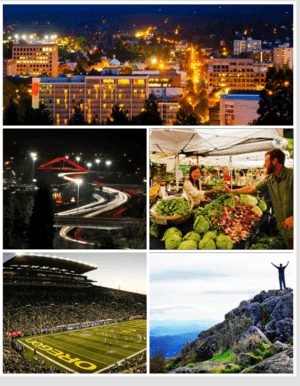 As of the 2010 census, Eugene had a population of 156,185; it is the second most populous city in the state (after Portland) and the county seat of Lane County. The Eugene-Springfield, Oregon metropolitan statistical area (MSA) is the 146th largest metropolitan statistical area in the US and the third-largest in the state, behind the Portland Metropolitan Area and the Salem Metropolitan Area. The city's population for 2014 was estimated to be 160,561 by the US Census. Eugene is home to the University of Oregon and Lane Community College. The city is also noted for its natural beauty, recreational opportunities (especially bicycling, running/jogging, rafting, and kayaking), and focus on the arts. Eugene's official slogan is "A Great City for the Arts and Outdoors". It is also referred to as the "Emerald City" and as "Track Town, USA". The Nike corporation had its beginnings in Eugene. In 2021, the city will host the 18th Track and Field World Championships. Eugene is named after its founder, Eugene Franklin Skinner. 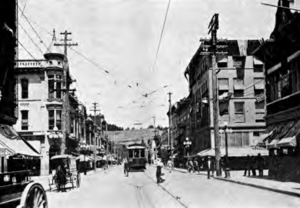 Until 1889, it was named Eugene City. In 1846, Skinner erected the first cabin in the area. It was used as a trading post and was registered as an official post office on January 8, 1850. At this time the settlement was known as Skinner's Mudhole. It was relocated in 1853 and named Eugene City, but was not formally incorporated as a city until 1862. Skinner later ran a ferry service across the Willamette River where the Ferry Street Bridge now stands. The city's name was shortened from Eugene City to Eugene in 1889. Eugene grew rapidly throughout most of the twentieth century, with the exception being the early 1980s when a downturn in the timber industry caused high unemployment. By 1985, the industry had recovered and Eugene began to attract more high-tech industries. Like the rest of the Willamette Valley, Eugene lies in the Marine West Coast climate zone, with Mediterranean characteristics. Under the Köppen climate classification scheme, Eugene has a cool-summer Mediterranean climate (Köppen Csb). Temperatures can vary from cool to warm, with warm, dry summers and cool, wet winters. Spring and fall are also moist seasons, with light rain falling for long periods. Winter snowfall does occur, but it is sporadic and rarely accumulates in large amounts: the average seasonal amount is 5 inches (12.7 cm), and the median is 0. The record snowfall was 3 feet (91 cm) deep due to a pineapple express in late January 1969. The record snowfall for March was 8 inches (20 cm) deep in 2012. The hottest months are July and August, with average highs of around 82 °F (28 °C), with an average of 15 days per year above 90 °F (32.2 °C). The coolest month is December, with the average daytime high in the mid-40s°F (7–8 °C), and nights averaging just above freezing. There are 54 nights per year with a low below freezing, and about three days with highs not exceeding freezing. The record high low was 73 °F (23 °C) in 2006. Eugene's average annual temperature is 52.1 °F (11.2 °C), and annual precipitation at 50.9 inches (1,290 mm). Eugene is slightly cooler on average than Portland. Despite being located about 100 miles (160 km) south and having only a slightly higher elevation, Eugene has a more continental climate, less subject to the maritime air that blows inland from the Pacific Ocean via the Columbia River. Eugene's average August low is 50.8 °F (10.4 °C), while Portland's average August low is 56.5 °F (13.6 °C). Average winter temperatures (and summer high temperatures) are similar for the two cities. This disparity may be additionally caused by Portland's urban heat island, where the combination of black pavement and urban energy use raises nighttime temperatures. Extreme temperatures range from −12 °F (−24 °C), recorded on December 8, 1972, to 108 °F (42 °C) on August 9, 1981. The census of 2000 showed that there were 137,893 people, 58,110 households, and 31,321 families residing in the city of Eugene. The population density was 3,404.8 people per square mile (1,314.5/km²). There were 61,444 housing units at an average density of 1,516.4 per square mile (585.5/km²). The racial makeup of the city was 88.15% White, down from 99.5% in 1950, 3.57% Asian, 1.25% Black or African American, 0.93% Native American, 0.21% Pacific Islander, 2.18% from other races, and 3.72% from two or more races. 4.96% of the population were Hispanic or Latino of any race. 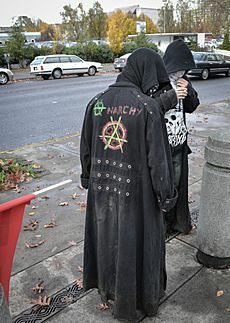 Some Eugene anarchists gained international notoriety in 1999 for their perceived role in the violent protests at the WTO Conference in Seattle. Eugene resident John Zerzan, an editor of the Green Anarchy magazine, has been associated with the growth of the green anarchist movement and with the philosophy behind black bloc tactics of the Seattle riots. During a Reclaim the Streets event in 1999, some protesters blocked downtown streets and smashed the windows of three stores and threw stones and bottles at police. Following those protests, then-mayor Jim Torrey described the city as "the anarchist capital of the United States." In the fall of 2003, neighbors noticed that "an unassuming two-acre remnant orchard tucked into the Friendly Area Neighborhood" had been put up for sale by its owner, a resident of New York City. Learning that a prospective buyer had plans to build several houses on the property, they formed a nonprofit organization called Madison Meadow in June 2004 in order to buy the property and "preserve it as undeveloped space in perpetuity." 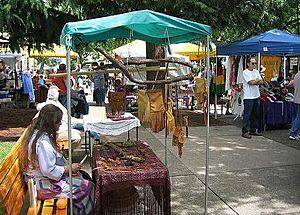 In 2007 their effort was named Third Best Community Effort by the Eugene Weekly, and by the end of 2008 they had raised enough money to purchase the property. The City of Eugene has an active Neighborhood Program. Several neighborhoods are known for their green activism. Friendly Neighborhood has a highly popular neighborhood garden established on the right of way of a street never built. There are a number of community gardens on public property. Amazon Neighborhood has a former church turned into a community center. Whiteaker hosts a housing co-op that dates from the early 1970s that has re-purposed both their parking lots into food production and play space. An unusual eco-village with natural building techniques and large shared garden can be found in Jefferson Westside neighborhood. A several block area in the River Road Neighborhood is known as a permaculture hotspot with an increasing number of suburban homes trading grass for garden, installing rain water catchment systems, food producing landscapes and solar retrofits. Several sites have planted gardens by removing driveways. A 65-tree filbert grove on public property is being restored by citizen volunteers in cooperation with the city of Eugene. There are deepening social and economic networks in the neighborhood. Eugene museums include the University of Oregon's Jordan Schnitzer Museum of Art and Museum of Natural and Cultural History, the Oregon Air and Space Museum, Conger Street Clock Museum, Lane County Historical Museum, Maude Kerns Art Center, Shelton McMurphey Johnson House, and the Science Factory Children's Museum & Planetarium. Eugene is home to numerous cultural organizations, including the Eugene Symphony, the Eugene Ballet, the Eugene Opera, the Eugene Concert Choir, the Northwest Christian University Community Choir, the Oregon Mozart Players, the Oregon Bach Festival, the Oregon Children's Choir, the Eugene Youth Symphony, Ballet Fantastique and Oregon Festival of American Music. Principal performing arts venues include the Hult Center for the Performing Arts, The John G. Shedd Institute for the Arts ("The Shedd"), Matthew Knight Arena, Beall Concert Hall and the Erb Memorial Union ballroom on the University of Oregon campus, the McDonald Theatre, and W.O.W. Hall. 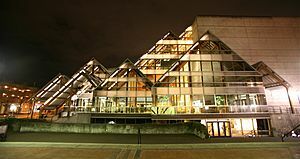 A number of live theater groups are based in Eugene, including Free Shakespeare in the Park, Oregon Contemporary Theatre, The Very Little Theatre, Actors Cabaret, LCC Theatre, and University Theatre. Each has its own performance venue. Eugene's visual arts community is supported by over 20 private art galleries and several organizations, including Maude Kerns Art Center, Lane Arts Council, DIVA (the Downtown Initiative for the Visual Arts), the Hult Center's Jacobs Gallery, and the Eugene Glass School. In 2015, installations from a group of Eugene-based artists known as Light At Play were showcased in several events around the world as part of the International Year of Light, including displays at the Smithsonian and the National Academy of Sciences. Spencer Butte Park at the southern edge of town provides access to Spencer Butte, a dominant feature of Eugene's skyline. 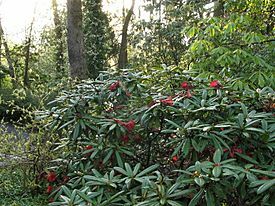 Hendricks Park, situated on a knoll to the east of downtown, is known for its rhododendron garden and nearby memorial to Steve Prefontaine, known as Pre's Rock, where the legendary University of Oregon runner was killed in an auto accident. Alton Baker Park, next to the Willamette River, contains Pre's Trail. Also located next to the Willamette are Skinner Butte Park and the Owen Memorial Rose Garden, which is home to more than 4,500 roses of over 400 varieties, as well as the 150-year-old Black Tartarian Cherry tree, an Oregon Heritage Tree. Eugene, Oregon Facts for Kids. Kiddle Encyclopedia.